Washington, D.C. – U.S. Senator Rob Portman (R-Ohio) and U.S. 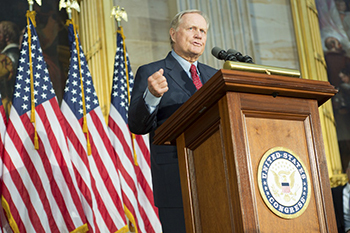 Congressman Pat Tiberi (R-OH-12) have renewed a bicameral legislative push to award the Congressional Gold Medal to Ohio native Jack Nicklaus in recognition of his service to the nation in promoting excellence and good sportsmanship in golf. Portman originally introduced the measure in May 2012, and companion legislation passed the House during the 112th Congress. Since 1776, a diverse group of individuals has been honored with the Congressional Gold Medal, including Sir Winston Churchill, Bob Hope, George Washington, Robert Frost, Joe Louis, and Mother Teresa of Calcutta. Recent recipients include golfing legend Arnold Palmer, Neil A. Armstrong, the first human to walk on the Moon, Edwin E. “Buzz” Aldrin, Jr., Michael Collins, and John Herschel Glenn, Jr.
Nicklaus was born in Upper Arlington, Ohio, and founded the Memorial Tournament, which is a PGA Tour golf tournament played on a Nicklaus-designed course in Muirfield Village Golf Club in Dublin, Ohio.